On February 9, Torys was pleased to welcome special guests from Right to Play to our Toronto office. Right to Play's Sarah Stern, corporate partnerships manager, and project coordinator Irene Kpodo from Ghana, spoke to Torys lawyers and staff about some of the organization's projects in Africa. They discussed Right to Play's involvement in teaching children through sports, games and activities about leadership, cooperation, self-confidence, respect for others, gender equality and health. Torys has a longstanding pro bono relationship with Right to Play, whose mission is to improve the lives of children in some of the world's most disadvantaged areas by using the power of sport and play for development, health and peace. Based in Toronto, Right to Play has offices in six countries and operates programs in Africa, Asia and South America. 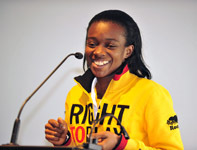 The Right to Play movement traces its roots to the 1992 Lillehammer Olympics and continues to feature many Olympic, amateur and professional athletes as its ambassadors, endorsers, fundraisers and volunteers. 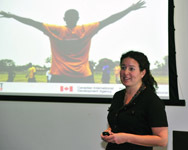 Sarah Stern describes some of the work Right to Play does to help children and youth in developing countries. Irene Kpodo describes some of her personal experiences helping children and youth.